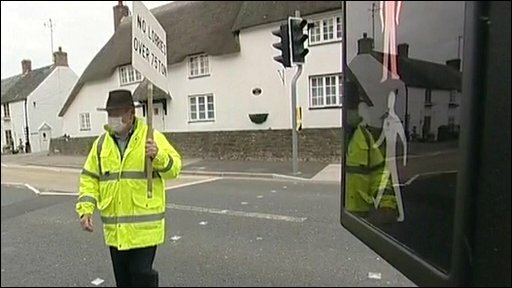 Tony Fuller: "We are afraid that the lorries are going to crash into our home"
A Dorset pensioner angry at lorries driving through his village blocked traffic for an hour by making sure a pelican crossing was in constant use. Tony Fuller, 77, and his neighbours carried out the protest in Chideock, near Bridport, on Tuesday. Traffic on the A35, the main coastal road between Bournemouth and Exeter, backed up within minutes. Mr Fuller said the roads were too narrow for lorries and he wanted a bypass built around the village. He said his house had been crashed into by vehicles twice and on one occasion the driver died. He added: "It's virtually like a motorway, in fact it's got as much traffic on it as a motorway but there's no pavements and the houses are right on the road. "The pollution in the village is terrible. You can't walk through the village without choking." Is dawdling on a crossing illegal? He said he was upset that plans for a bypass were abandoned several years ago. He added: "If our local county council is spending £77m on a bypass to Weymouth for the Olympics for two weeks... why don't they come and do something for the citizens and parishioners of Chideock? "We only want them to show they are doing something and when they do we will stop, but if they don't we shall continue, now, year after year." Mr Fuller said about 50 residents had already pledged their support to the protest. He added: "If they all turn up and they each press that button once, one after the other, that's 50 times that traffic will be stopped and it will cause chaos. "Because they've only gone across once each, they can't be prosecuted for using the crossing that was put there for their benefit." The Highways Agency, which is responsible for the A35, declined to comment. 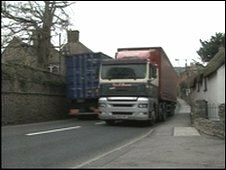 Dorset County Council said the Weymouth relief road had mostly been funded by the Department for Transport and the council's contribution had totalled £8.6m rather than £77m.